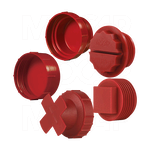 MOCAP manufactures several families of dip moulded vinyl plastic plugs, injection moulded plastic plugs and rubber moulded plugs for all of your product protection, masking or appearance finishing needs. From injection moulded low density polyethylene (LDPE) plastic tapered cap plugs, sheet metal plugs and tube end plugs to vinyl dip moulded shipping plugs and high temperature masking plugs, to EPDM and silicone rubber masking plugs, MOCAP has the quality products to satisfy your requirements. 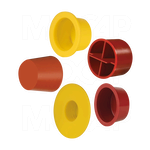 MOCAP offers hundreds of sizes, shapes and designs of low density polyethylene (LDPE) plastic plugs stocked and ready to ship. 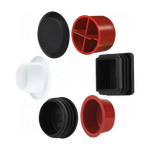 MOCAP offers vinyl dip moulded plugs in standard flexible PVC material for shipping and protection, and high-temperature versions for masking. MOCAP offers a wide range of EPDM rubber and Silicone rubber plugs for paint, powder coat and spray masking applications, including tapered plugs, washer plugs and pull plugs. Many sizes are in stock and ready to ship. Use a MOCAP plug for product protection during assembly, conversion, or shipping. Try a low cost MOCAP plug to mask against debris, painting, spraying or powder coating. Add a finished quality appearance to the sheet metal or tubing component of your product with a MOCAP plug.